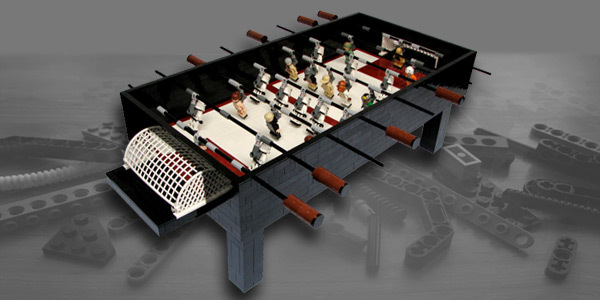 I have seen many Lego foosball tables in my time. They were big, small, sturdy, bad quality, playable and for your eyes only, but this foosball table is something really special. I don’t know whether I like more the style it is made in or the fact that it is made with Star Wars characters, but I am sure that you know the amount of work and time invested in making an impressive foosball table like this one. The entire foosball table, from top to bottom is made from Lego and the only thing that stands out is the foosball ball. I like the idea to have a plastic ball instead of Lego ball so that works fine for me. Let us look at the overall design of the table. It is not the biggest foosball table and I like that because one of the charms of Lego products is the fact that you can make everything in the pocket version. As you can see, the table has four sturdy legs and it is a pretty stable. It doesn’t have leg levelers but you don’t need that because you have LEGO foosball table! If the surface is not 100% straight just add (or reduce) legos from the legs. The table has 4 foosball rods on each side, which is a regular number of rods on each side. Rods are made from legos just like the handles and rods can spin without any problem. The same thing is with the foosball players. Both teams, Stormtroopers against the Rebels, are made in the real 1-man goalie formation, which means that the table has 22 players in total, 11 on each side. For now, the table looks pretty playable to me; it has the rods and the players like they should be. The playing surface is made in two colors brown and white. White is the majority of the field and brown color actually emphasizes the border, the center of the field and the penalty area (area in front of the goalkeeper in soccer). The surface is smooth which is pretty impressive since it is a Lego foosball table. Goals aren’t built in the foosball table, like most foosball tables, but they are made like the real soccer goals with plastic nets. That is a better solution for Lego foosball table because goals are available for purchase in one piece. Final verdict – Playable or not? Looking at the foosball table from every angle and after reviewing the style and the creativity of the Lego maker I am absolutely sure that the table is playable. Actually, I am pretty sure not only it is playable but it will offer hours of fun to every Lego and (or) Star Wars fan which encounters with this impressive game table. Mark is a foosball player who loves to write and talk about foosball so he made a blog. The blog is called the Foosball Zone and it is made for every rookie, hobby player and more advanced foosball player who wants to learn more about foosball. Check out his blog Foosball Zone where you can read everything you need to know about table foosball!